Anyone who is an avid lover of reading understands the need for a reliable bookmark. Using the old trick of folding down the corner of a page to mark your place is not only damaging to the book but is an unreliable method of marking. There’s a vast array of beautiful and creative bookmarks out in the world. Here, we’ve compiled the best bookmarks to satisfy your creativity and serve your bookmarking needs. A page sleeve is a unique bookmark that is completely customizable and slides easily over the corner of a page for easy marking. Taking a blank envelope, you cut a corner of the envelope off and wrap it in alternating strips of colored or designed tape. The tape will add flair and stability to the flimsy envelope. Requiring a bit more effort and creativity, this type of bookmark will not only be durable, it’ll be stylish. After downloading and printing a shape pattern for the bookmark, you gather the necessary fabrics, decorations, and sewing supplies. Once you have all the items, begin to assemble the bookmark by layering the swatches of fabric and sewing them together. It’s not difficult to find a bookworm who also loves animals. If the bookworm in your life would completely fall in love with an animal-shaped bookmark, you’re in luck. While they may not be easy to find in stores, they’re easy to create by hand. All you’ll need are a hammer, soft wire, wire cutters, and some time to be creative. If you’re looking for a unique bookmark that can be customized in a variety of ways, this crochet lace bookmark hits it on the mark. While creating this bookmark will require some skills with crochet needles, the results will be well worth the effort. There are many crochet bookmark patterns to be found on the internet that will give you an endless supply of possibilities. For a bookmark that would be the perfect companion piece to an unconventional bookworm, this twine and charm bookmark should be your first choice. Crafted by hand, these bookmarks are made from simple materials such as linen twine and assorted beads. They are easy to create, require few tools, and are incredibly elegant. Your favorite activity from your childhood can now be put to good use as an adult. Using a pair of scissors, you can cut slices of cardboard into different shapes and design them using any type of coloring medium suits your fancy. This type of simple creativity is boundless in its applications. To help the bookmarks acquire a longer lifespan, consider protecting them with a layer of clear tape. 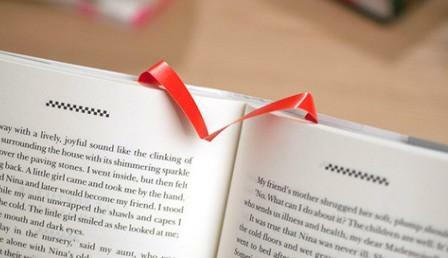 If cute and convenient is your game, a hand-crafted cloth corner bookmark should definitely up your game. Using these simple steps, you can create a little bookmark that will slide over the corner of your page to make your place in your book. When crafting this bookmark, you can either use needle and thread as per the guide or you can opt to use fabric glue. This foxy bookmark is one of the best bookmarks to craft because it requires so little time to create. You simply print the bookmarks on a thick paper and use scissors or an Exacto knife to cut along the designated border. The simple printed image becomes a cute bookmark that sits on the top of a page with its ears poking out. Using a transparent A4 sheet, separate it into equal sections using a ruler. Once the sections have been designated, draw playful pictures or doodle abstract designs on them using any color of pen you desire. These pictures and designs can then be colored in or given colorful borders to add richness and texture. Lastly, using scissors or an Exacto knife, cut the A4 sheet at the sections to turn them into cute bookmarks. This is a creative bookmark that combines the love of reading with the love of nature. Take a thin flower such as a dandelion or a violet, smash it inside of a book to dry out for a few weeks, and once it’s dry, attach it to a piece of A4 sheet. Cut around the flower in the shape of a bookmark and laminate the bookmark to add durability.